When the Environmental Protection Agency decides next week which counties violate its more protective federal smog standard, more than 500 counties could be on the list — mostly in the eastern third of the country and Southern California. "This is a major event in clean air. This kind of event happens only every decade or so," EPA Administrator Mike Leavitt said Thursday. "We list this under the banner of clean air, but it really is about longer lives, and about better health and also economic prosperity." States and counties were told by EPA in December they were being considered possible "non-attainment" areas. The agency in 1997 adopted a new standard for ground-level ozone, a precursor to smog, that requires state and local governments to cut pollutants from power plants or other sources according to deadlines varying from three to 20 years. More than 110 million people live in areas with unhealthy levels of ozone, one of the leading causes of severe respiratory illnesses. Those areas also could include dozens of sites with the National Park Service, including several of its most popular national parks. Leavitt told reporters summoned to his office Thursday that the agency will produce next week a final list of counties — up to 506 — that do not meet the more stringent air quality standards for ozone. State and local officials will have three years to submit plans on how they intend to clean the dirty air and come into compliance. Counties on the list also will be put into one of six categories, ranging from "marginal" to "extreme" noncompliance that require action such as vehicle inspections and maintenance programs, Leavitt and other senior EPA officials said. The tougher smog requirement and a new standard for soot, or fine particles, were issued by the Clinton administration out of concern that vulnerable groups such as children, the elderly and people with respiratory illnesses were not adequately protected by the old standards. 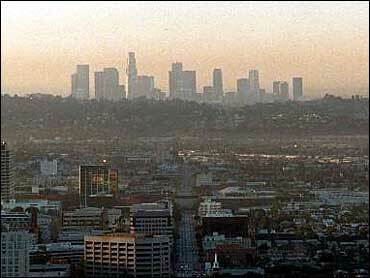 The new standard is based on an eight-hour, rather than one hour, measurement of smog averaged over three days. It also requires fewer parts per billion of ozone in the air, from 120 parts per billion down to 85. Its implementation was delayed by failed court challenges by the trucking and other industries. EPA officials had cited studies showing that longer-term exposures to moderate levels of ozone may cause irreversible changes in the lungs. Leavitt said EPA was focusing on several major initiatives to clean the air, including a program to reduce nitrogen oxide and sulfur releases from power plants and a requirement for cleaner diesel fuel and less polluting large truck engines. In deciding which counties are violating the new standards, Leavitt minimized the significance of recent private meetings he had with members of Congress, such as Rep. Joe Barton, R-Texas, chair of the House Energy and Commerce Committee. Leavitt said the meetings let lawmakers air concerns, but his decisions would be based on the law's requirements. Barton has been trying to remove Ellis County, part of his congressional district, from the list of smog-violation areas but has denied being influenced by campaign contributions from cement makers there that would benefit. His office had no immediate comment Thursday. The EPA currently lists a total of 146 areas as in nonattainment of standards on ozone, carbon monoxide, sulfur dioxide, particulate matter and lead. The sites are in 34 states, Guam, Puerto Rico and the District of Colombia.